"The quality of public space is up to people's participation. If all participants are just customers it is not a real public space"
Atelier Bow-Wow is a Tokyo-based architecture firm, founded in 1992 by Yoshiharu Tsukamoto and Momoyo Kajima. The firm is well known for its domestic and cultural architecture and its research exploring the urban conditions of micro, ad-hoc architecture. Momoyo Kaijima was born in Tokyo in 1969. She received her undergraduate degree from the Faculty of Domestic Science at Japan Women's University in 1991 and both her graduate (M.Eng.) and post-graduate degrees were from Tokyo Institute of Technology in 1994 and 1999. She was also a guest student at Eidgenössische Technische Hochschule Zürich (ETH) from 1996-1997. In 2000 Kaijima became an Assistant Professor, and in 2009 an Associate Professor, at the Art and Design School of the University of Tsukuba. Like Tsukamoto, in 2003 she was a visiting faculty (as a design critic) in the Department of Architecture at Harvard GSD and between 2005 and 2007 she was also a guest professor at ETH Zürich. 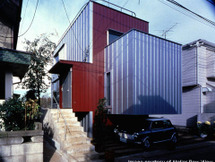 In 2010 she was the Architect in Residence at the University of Auckland.